As many of you know, I also have a Facebook group called “Manila Nostalgia”. There have been numerous posts lately regarding the restoration and revitalization of my favorite old haunt, the Escolta. 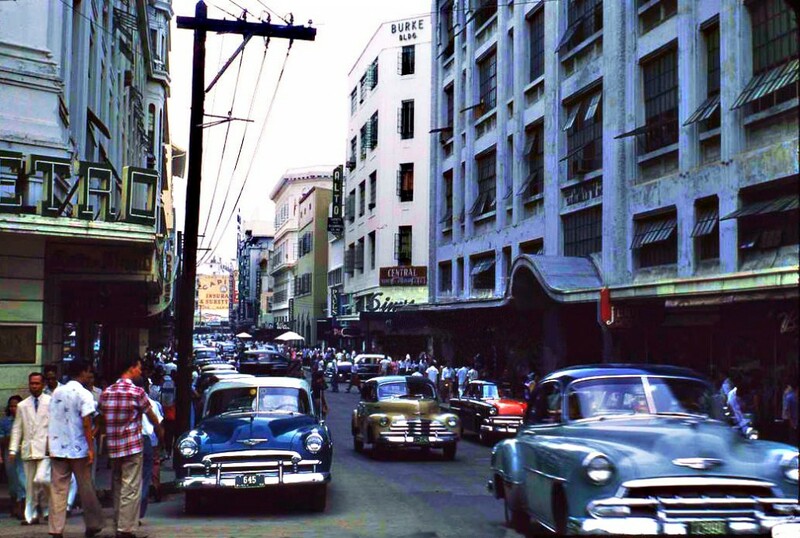 My family used to have a jewelry store there called the Gem Gift Shop and as a result, I spent many an afternoon wandering around, stopping at the many stores that abounded the “Rodeo Drive” of Manila in the Fifties. I’ve already written articles about the history of the Escolta and the Crystal Arcade but haven’t as yet written about some of the more well-recognized stores located there. 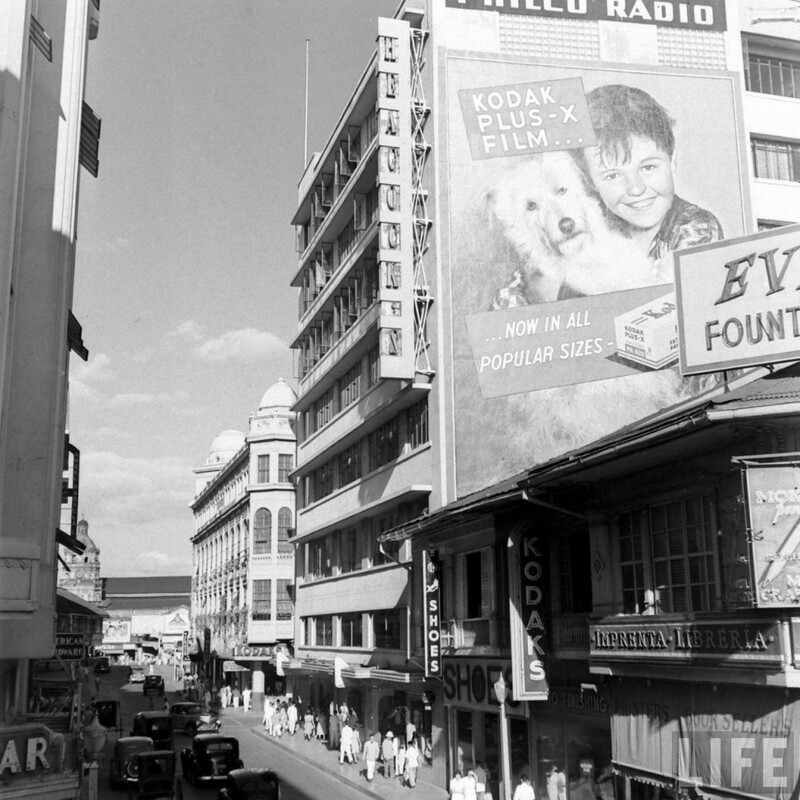 So..I thought I’d devote the next few articles on the stores that have come and gone but continue to remind us of a time when the Escolta was THE place to shop. At the onset of the American occupation, there were a few visionaries who saw opportunities in this yet uncharted but promising U.S. possession. One of those was the wholesale jewelry firm of Heacock & Freer from San Francisco. The young partner, Mr. H.E. 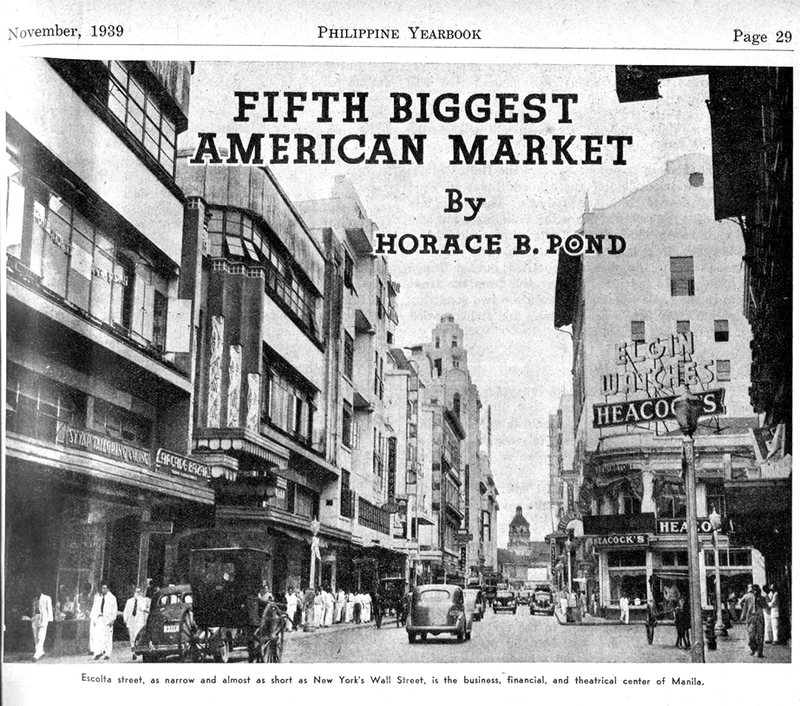 Heacock arrived in Manila in 1900 carrying a line of jewelry; mainly men’s furnishing such as watches, collar and cuff buttons that might appeal to the American ex-soldiers, businessmen, and the well-to-do Manila elite. 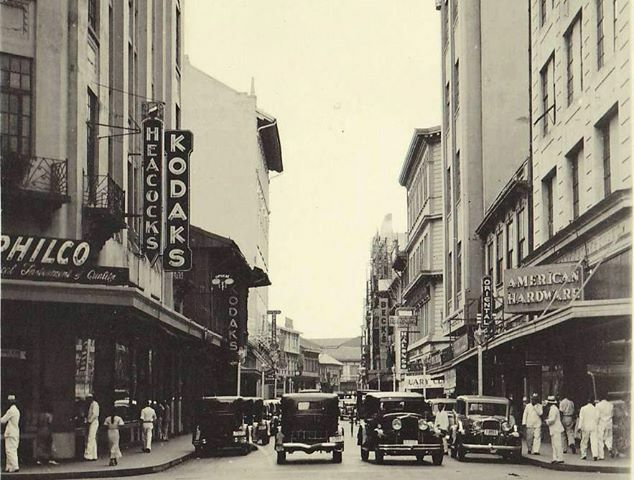 He opened a retail store on the second floor of the McCullough Building next to the Hotel Metropole by the Sta. Cruz bridge, filling his inventory not only with men’s watches, chains and cufflinks but clocks, silverware, cut glass and other general merchandise. In 1909 H.E. Heacock and his partner, Freer, sold the business to Samuel Gaches and other partners. 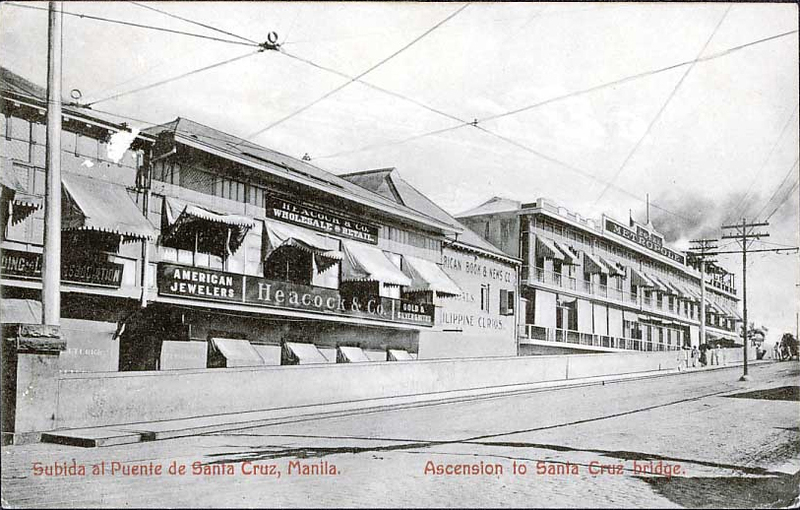 Gaches graduated from Stanford in 1899 and came to Manila in 1900 for the military postal service. He quickly rose to head the money-order section, and in 1904 went from that post to become chief agent of the internal revenue bureau. Finding an opportunity in retailing, he resigned from civil service to become treasurer, then later president of the H. E. Heacock Company. As it turned out, he was a natural-born entrepreneur and became a pioneer in retailing innovation. 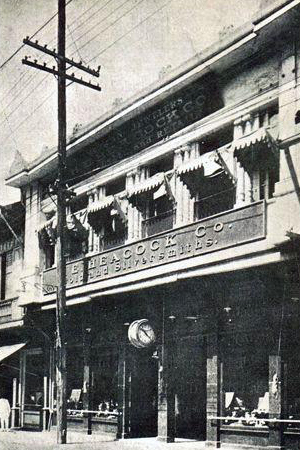 Heacock’s grew ever more popular and by 1918, with the assistance of Dr. Burke, a new four story concrete building was erected and the store moved once again to the northwest corner of Escolta and David. 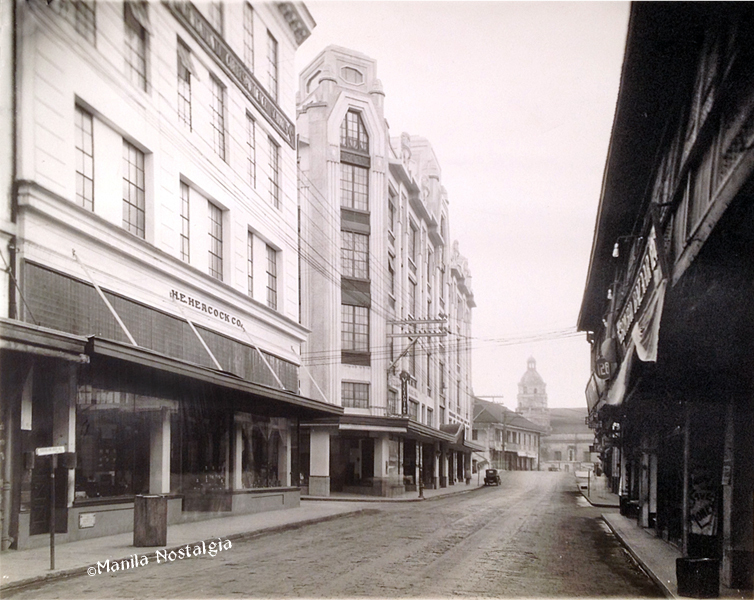 The Escolta was evolving from the old Spanish era buildings that featured wooden construction with sliding windows of capiz shells to modern concrete and glass edifices. Below, the newly completed Burke building stands next to the Perez-Samanillo Building. c.1918 The reason it looks so deserted is due to the photo taken at 5:00 AM. In the meantime, Heacock’s continued to grow, acquiring several businesses (C. Alkan, D. Denniston, and Manila Trading Supply) that included sporting goods, firearms, photographic and office equipment. It soon became an all-encompassing provisioner. In the Thirties, Heacock’s took over the Philco Radio line and the refrigeration line of General Motors. The Philippines was in a growth mode. More Americans discovered the prosperity found in these islands and heavily invested in its future. As well, Heacock’s started opening branches in Iloilo, Cebu, Davao and Baguio. 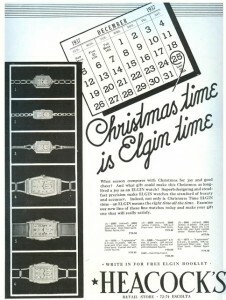 It soon out-distanced the competition such as I.Beck’s and American Hardware Company. 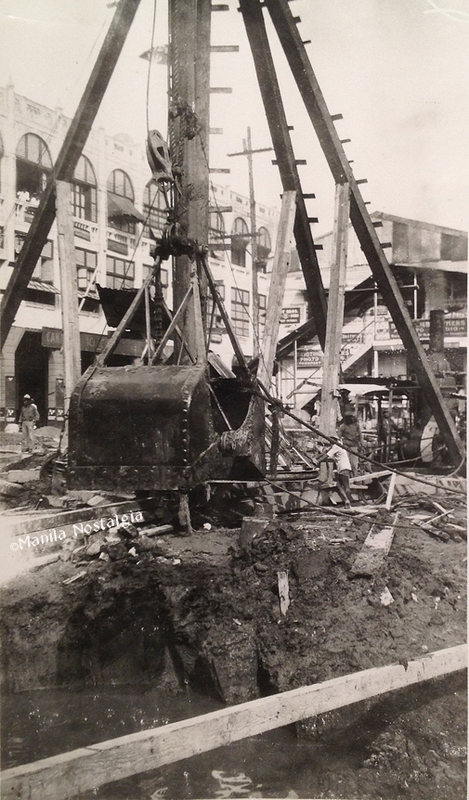 In 1929, construction started on a new 8 floor building (including basement) on the south west corner of Escolta and David streets. The pictures below show construction underway. The photo below looks out onto Escolta and the Burke Building. 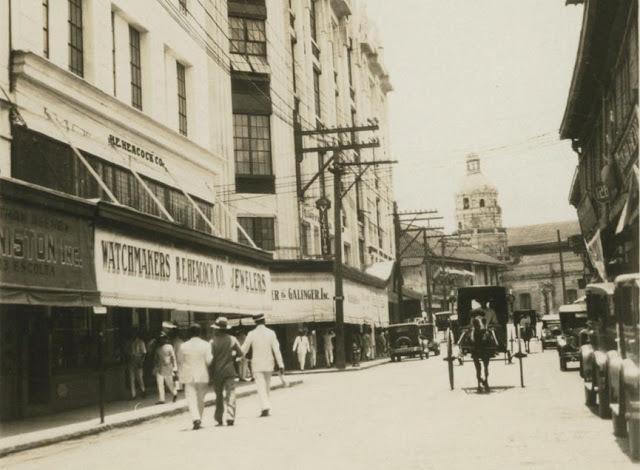 In September, 1930 the H. E. Heacock Company removed from its old quarters to its fine new million-peso, eight-story building immediately across the Escolta at the same intersection, Escolta and David. The main entrance on the Escolta opens into Heacock’s proper, the jewelry store; then comes Denniston’s, the photographic department, with its valuable Eastman agency, and then the office equipment department. The jewelry store is L-shaped; one of the illustrations gives a good view of it. In the new building the Heacock store occupies the main and mezzanine floors, both handsomely finished and artistically arranged. The second floor is also all occupied by the Heacock company; the offices are there, and the stock, accounting, mail order, wholesale and optical departments. Four rooms on the third floor are given over to stock and records; the other rooms of that floor are rented as offices, as are the rooms and suites of the fourth, fifth and sixth floors. These rooms, all of them desirable because of their location and the building they are in, offer great latitude of choice. The seventh floor accommodates Heacock’s engraving and printing, watch-making, metal engraving, jewelry repairing and manufacturing departments; also the optical shop, Denniston’s photo laboratories, and stock of the office equipment department. The basement, under the entire building, counts as the eighth floor. It is to accommodate automobiles during the day. Seventy-five cars will not crowd it; a wide ramp opens from Calle David, egress and ingress are safe and convenient. This public service in connection with the Heacock building will materially mitigate the downtown parking nuisance. 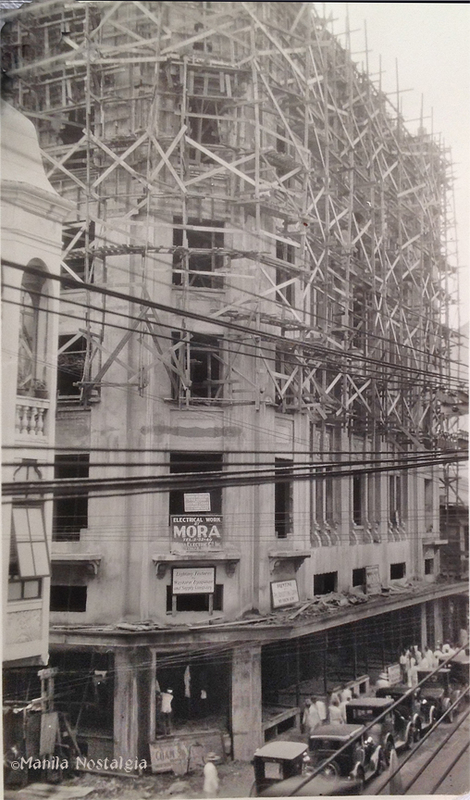 Unfortunately in August, 1937, an earthquake caused the destruction of the building on the Escolta, shutting down business. 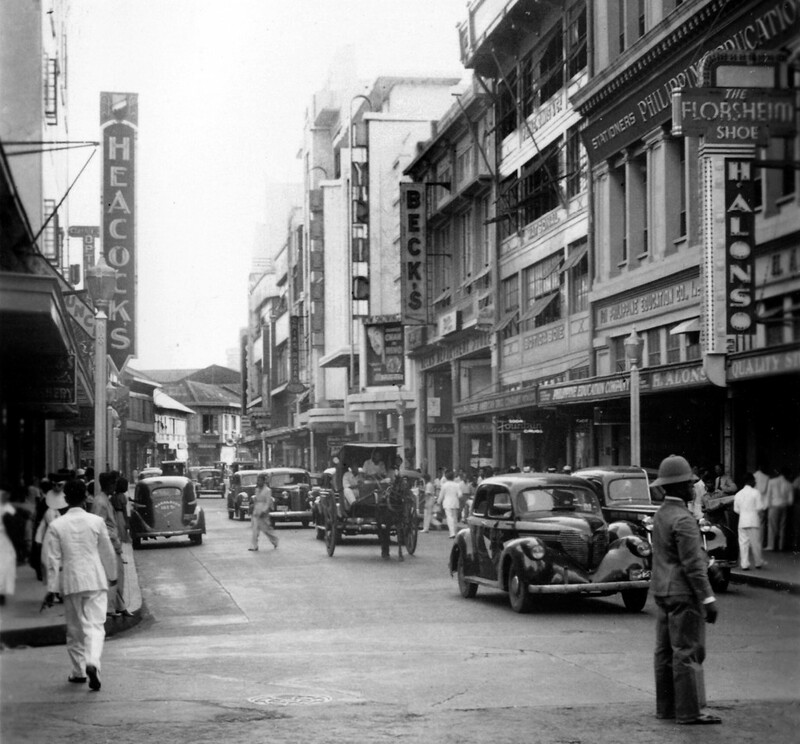 However within thirty days, Heacock’s had reorganized their departments, splitting them between temporary Escolta and Port Area locations while plans were made to rebuild at the same location on Escolta and David. 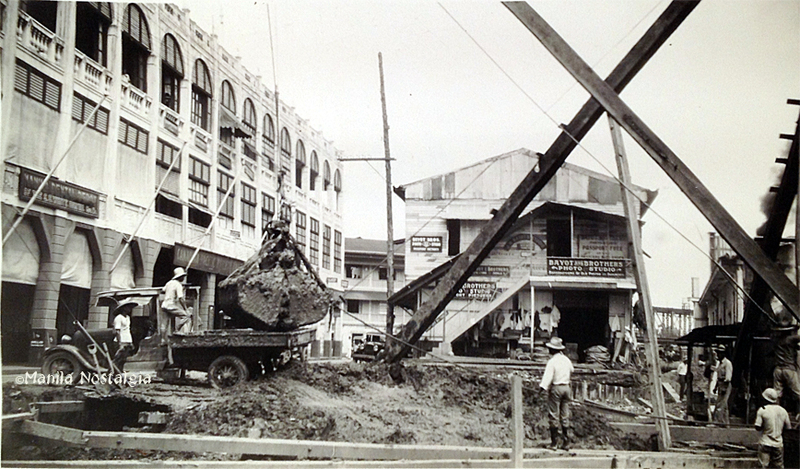 This article shows a photo of Heacock’s temporary location at the corner of Calle Soda and Escolta, taken probably around 1938 (although the article was dated 1939) . 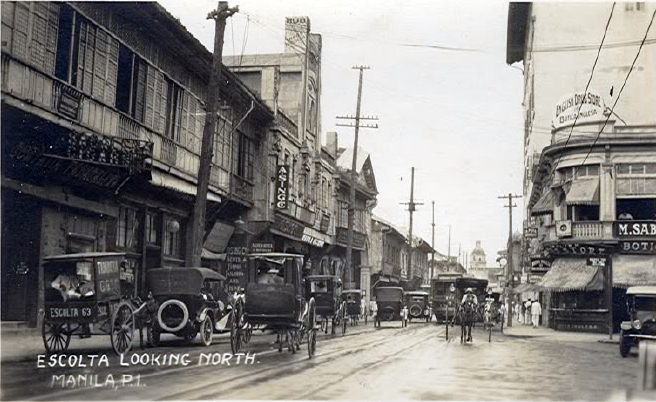 The new building at the same location of Escolta and David, just past the large Masonic Building on the right, was completed in 1938. Architects Fernando Ocampo, Tomas Arguelles, and George Koster drew the plans for this modern facility budgeted at PHP800,000. It would be the latest in office buildings and include pneumatic tubes to allow executives to communicate with any department without using the telephone. It had a 20-foot concrete vault and reinforced steel space to store ammunition, samples of aerial bombs, tear gas, machine guns and other equipment used by the Philippine army. It was beautiful as well as functional. Dao wood was used exclusively throughout to avoid warping in the humid climate, while narra was used in the bargain basement – another first for businesses of the day. The basement offered much the same merchandise but of slightly lower quality. Much was done to pay attention to the smallest detail. A beauty parlor was located on the third floor. Counters on the main sales floor were planned at the correct height for the average customer. And, it was the first totally air-conditioned building using air ducts passing through the building. 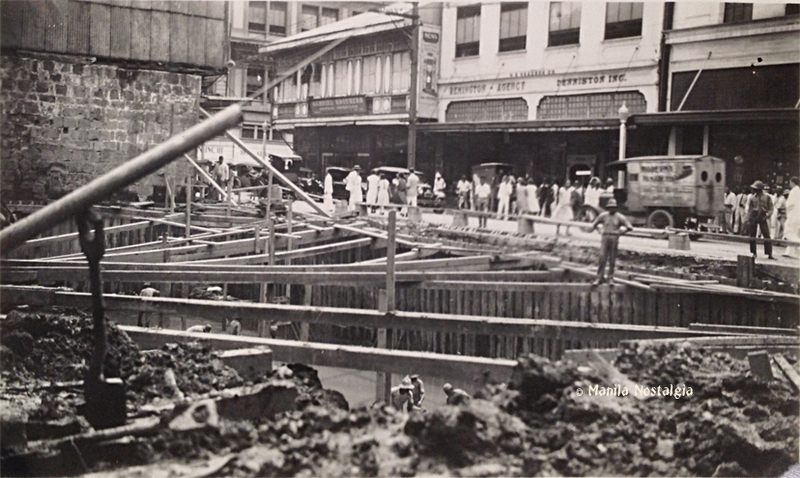 Much of the building was destroyed during the Battle of Manila however the business did survive and was brought back to life during the reconstruction period of 1946-1948. It was still a viable and popular department store in the Fifties. “I went out on pass again this morning with Dinny Gunn and Major Chenery, both of the staff of H.E. Heacock Company. We were out from 9:00 to 11:45 A.M. and finally succeeded in getting as far as the Escolta and the financial district. What a ghastly sight! A city of the dead! Not a building unscarred, although a few showed only minor damage. My office is among the lucky ones, although I could not get inside because of the debris and rubble all around that military equipment backed right up against the wall and doorway. From an outward inspection it appears that the first three floors have been gutted by fire, but above that it shows little outward signs of damage. The Hongkong and Shanghai Bank, the People’s Bank, the China Bank, and the National City Bank are completely gutted but the frameworks of the buildings, blackened by fire and smoke, still stand. The Bank of the Philippine Islands is completely destroyed and has collapsed, except for a few bits of wall of the ground floor. The Philippine National Bank (the old Masonic Temple on the Escolta) is completely gutted and the part facing the river is over half destroyed and one side has entirely collapsed. There is an immense crater just at the foot of the wall in this part in which it appears that a large bomb, or perhaps several of them, fell. The crater is at least 20 feet in diameter. The depth cannot be seen because it is nearly filled with dirty water. The 8-story Cu-Unjieng Building has completely collapsed and has fallen partly on Calle Pinpin and partly across the Escolta, blocking both streets to a height of two stories. (Bill) Chittick’s office on Calle Pinpin, just behind the debris of Cu-Unjieng Building, still stands but has been completely gutted by fire. During the occupation, the Japanese interned Sam Gaches, along with 4000 Allied civilians, at the University of Santo Tomas. His health declined even after he was liberated three years later and soon passed away in 1946. D.O. Gunn took over as President after Gaches’ death but only served a few years and was succeeded by Jose Orosa, one of the first Filipinos to be president of an American-owned company. 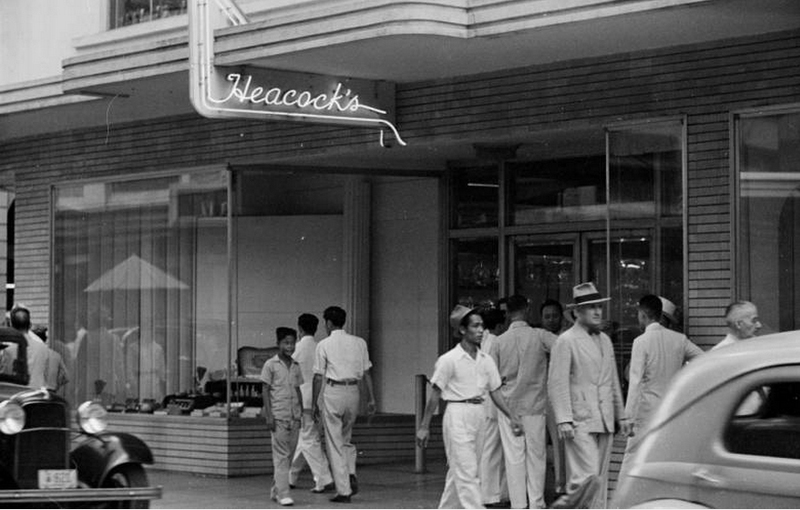 The store reopened during the reconstruction period and in 1948, Heacock’s was known as one of the most progressive companies of its day in terms of employee benefits. The Heacock employees enjoyed a profit-sharing privilege when given bonuses by the management based on the profits realized during that year. Each year the employees were given 15 days vacation leave and 15 days sick leave with pay. In addition, they were also entitled to free medical and dental service rendered by the company physician and dentist. 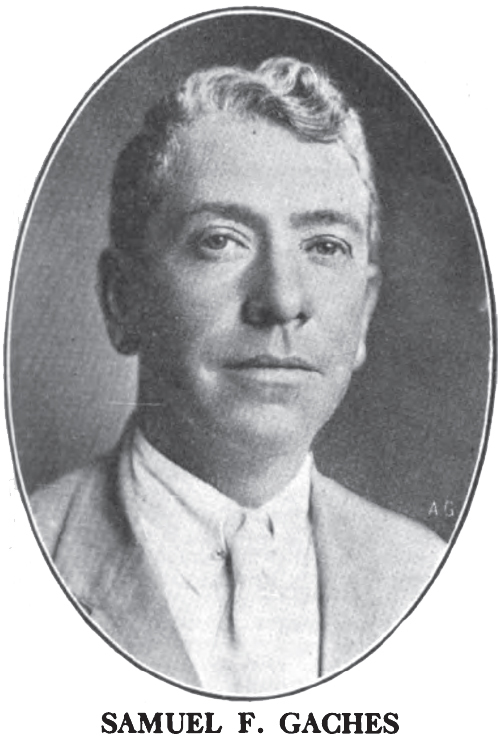 Along with his competitor, Beck’s Department Store owned by Isaac Beck, Heacock’s imported and sold American radio sets and equipment. Gaches, intrigued by the prospect of the growth of radio and even the future of television, started kzRH on July 14, 1939, from the top floor of the H.E. Heacock Building. 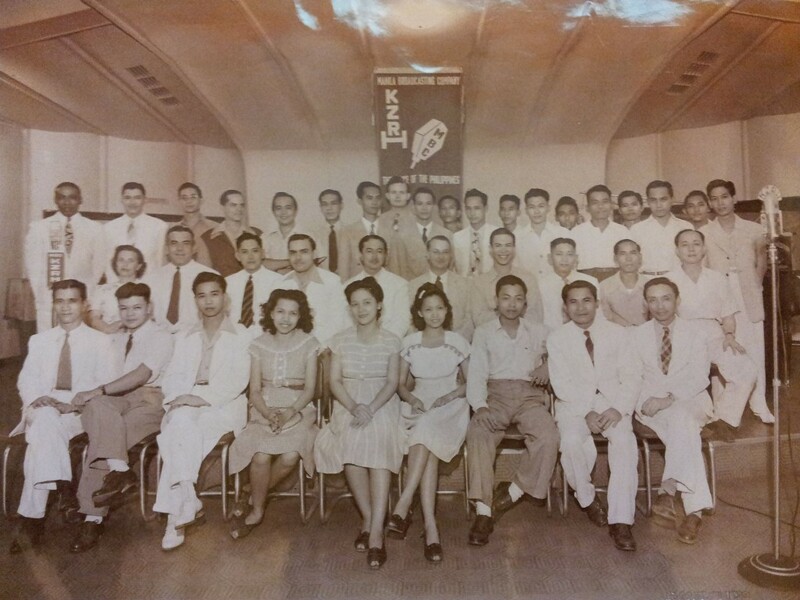 Above, the radio staff at kzRH, c. early 1950s. I miss the Escolta. I miss what it once was. I do hope that the whole area of Binondo, Plaza Moraga, Plaza Santa Cruz and specifically the Escolta can be revitalized. I’ve seen efforts by the younger generation to clean up the streets, clean up the Pasig with boats ferrying tourists to the old “downtown” area. Their passion and reverence for our heritage may be the only thing that can save this once beautiful district. As always, I invite you to write me at Manilanostalgia@gmail.com Send me your photos and share your memories. I would love to hear from you. Signing off now from Seattle. Lou, I love reading your blogs. It is informative and makes me nostalgic for old Manila! 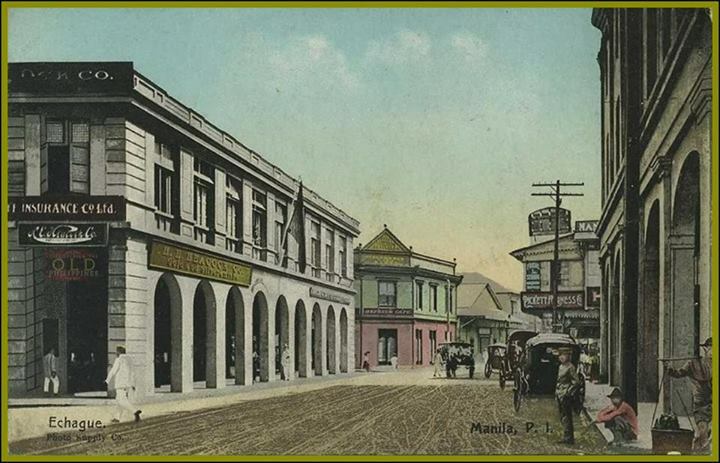 It was wonderful to know that a there’s a Facebook page dedicated to this history of sorts of Manila. I love reading “nostalgia” pieces of this kind. I’m a history buff and I congratulate you for coming up with this page. I look forward to reading more of this informative pieces. It gives me great pleasure. I caught the tailend of Escolta’s glory days when my mother and Lola brought me there when they go shopping at Syvel’s and Oceanic Commercial. I also remember my uncles and my dad having their fountain pens repaired at the Luis shop. I also had seen movies shown at Lyric and Capitol theaters. I think the Villar (or is De Luxe’s?) record store would set up shop later, in the early 70s. I could not recall the name of that other movie house (not Cine Sta Cruz) in the vicinity, and I used to browse books at Bookmark (David St.?). My first elevator ride was in one of the buildings along Escolta. My dad used to have a savings account at First National City Bank and I could still recall that Rosario St. was lined up with shoe stores. I think the Yutivo hardware was also in the area. There were also various school and office supplies shops in the area and the standout was Times Trading. I remember, too, that movie actors in-between jobs used to hang out in the coffee shops in the area; I recall seeing the late Rod Navarro and Nello Nayo hanging out there. Oh, yes, I still remember my Lola buying medicines at Botica Boie! Hi Lou. Thanks for this write-up about Heacock’s Dept Store. I am the daughter of Jose (Joe) Y. Orosa whom you mentioned as one of the first Filipinos to be President of an American-owned company. I have many wonderful memories of going to the store with my mother while she did her shopping. I loved it when everyone in the store would greet me “Good Morning/Good Afternoon Miss Orosa.” We always ended our visits by saying hello to my Dad in his office on the second floor. If he was not busy, he would take us to Botica Boie for lunch or merienda. Heacock’s would be at it’s most beautiful during the holiday season courtesy of Ronnie Laing who did the decor. He would always gift us with the same decor so our house looked like a mini-Heacocks! 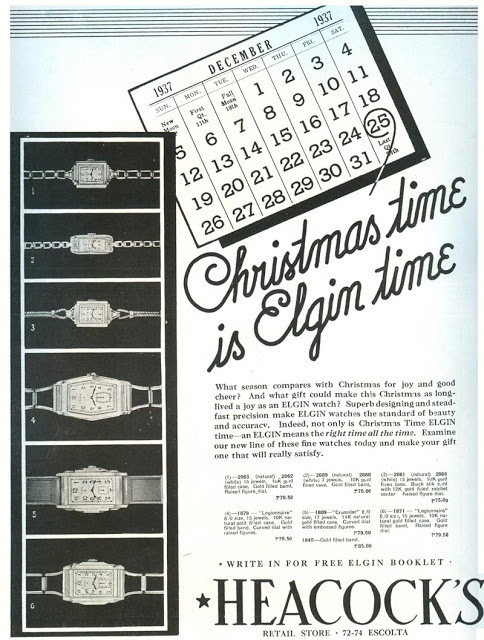 The holidays also meant receiving nice gifts from Elsie Gaches. She also had a yacht and we spent a lot of Sundays sailing with her. So many nice memories have come to the fore thanks to your article. Regards. 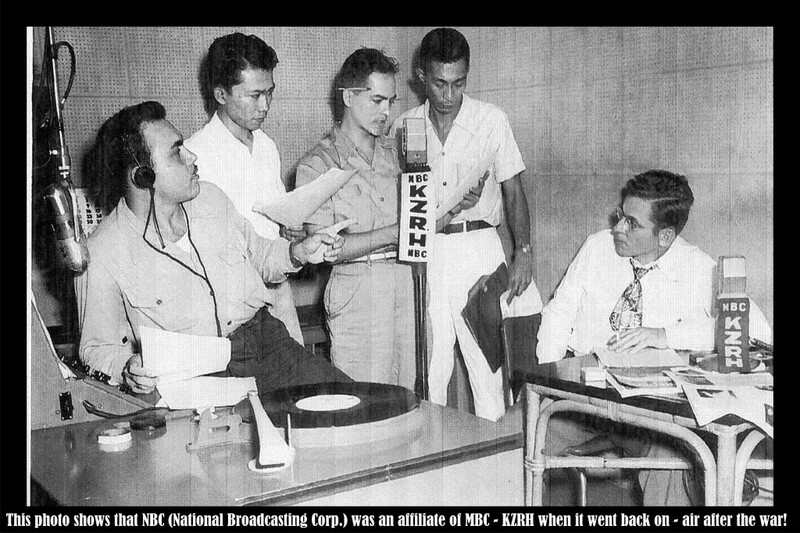 Radio Heacock, or KZRH, now DZRH will be celebrating its 75th year in broadcast, interrupted only the Japanese occupation and operating PIAM, the erstwhile KZRH during the war years! Radio during the American time was a tool to advertise the wares they sell and following, Isaac Beck of Beck’s, Samuel Gatches and Beltrand Silen became partners in establishing KZRH on July 16, 1939, with Hall Bowie, Leah’s father as the first announcer of the station! Radio Heacock/Heacock’s and Co., Inc., operated KZRH from July, 1939 until it was taken over by the Japanese Imperial Army sometime in January, 1942, under Japanese propagandist, Shohei Sasaka. Purchased by the Elizalde brothers, Don Manolo and Don Federico, KZRH went back on-air in time of the declaration of the Philippine independence in 1946 now under Manila Broadcasting Company! We hope to come up with a modest coffee-table book about KZRH-DZRH in time (hopefully) for the 75th year of KZRH.Thank you very much sir Lou. Mabuhay ka! 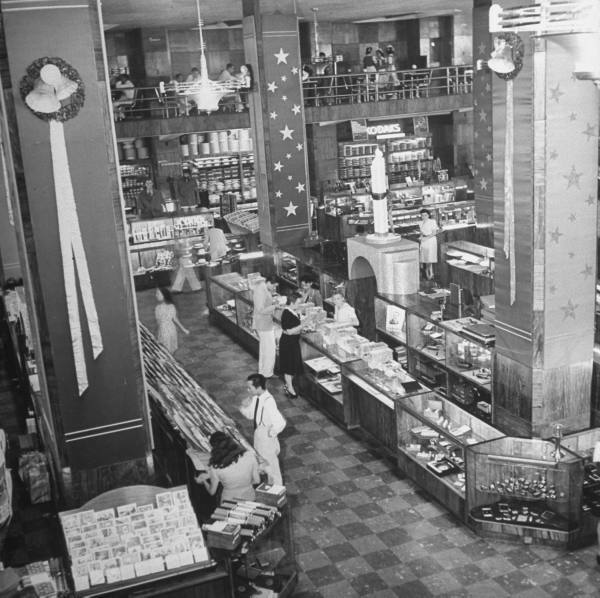 After shopping, Mom would go up to one of the top floors to the soda fountain and enjoy a mango ice cream. 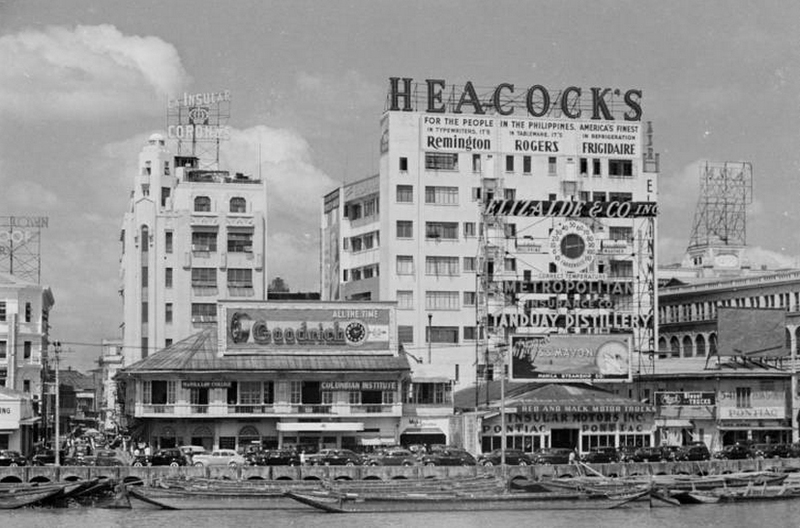 Heacock’s set the trend for large scale shopping in pre-war Manila. 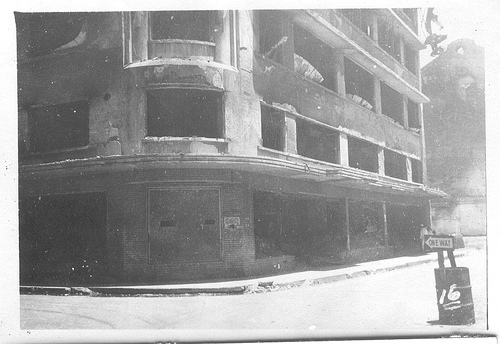 In the battle for Manila, as US forces approached, the Japanese set up naval torpedoes in many concrete buildings in the downtown district as well as in apartment buildings in Ermita and Malate. They used torpedoes salvaged from sunken Japanese warships in Manila Bay. I saw one torpedo set up in the Boulevard Apartments on MH del Pilar street, corner San Andres. I was awed to see how long these missiles were, 18 feet in length In fact, the Americans named them “Long Lance” torpedoes. 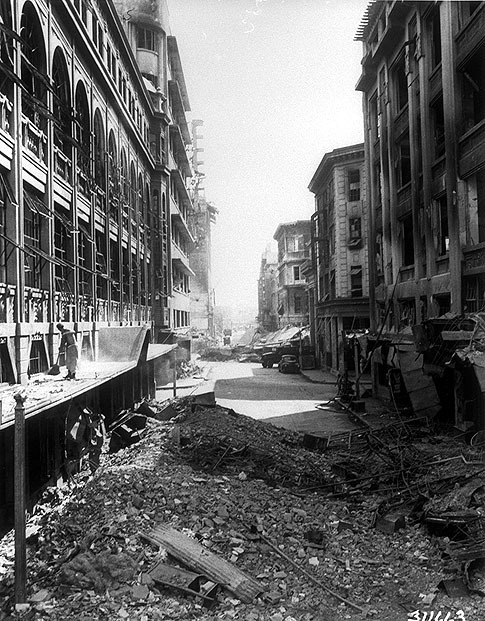 But although some models could carry as much as 1,100 pounds of explosive, they couldn’t bring down Manila’s buildings because these were constructed with steel and reinforced concrete to withstand earthquakes. As a historical footnote to KZRH, because of its high power the Japanese invaders used it for Gen. Jonathan Wainright to broadcast his surrender orders for all USAFFE forces under him to surrender. “Skinny” Wainright was humiliated when his equal, Gen. Masaharu Homma, refused to negotiate with him because Wainright insisted that he was only the commander for Corregidor, not for the Visayas and Mindanao. His attempt to bargain with the Japanese general failed, and Homma walked out on him. As he was returned to Corregidor that night, Wainright decided to surrender all his forces. He had no alternative because his 12,000 men garrison had already laid down their arms. Wainright was taken to the Japanese commander in Corregidor, a Colonel Sato. So, a 3-star American general surrendered to a Japanese colonel. ending the siege of Corregidor. Sato ordered him taken to Manila so he could broadcast his surrender. This was done over KZRH on May 7, 1942. Gen. Jonathan Wainright then became the highest ranking American POW. Hi Lou, thank you for continuing to post about our heritage and history. I don’t have the memories everyone else has, but as a young person, I find your posts are very inspiring. It was also nice to see my grandfather, Jose Orosa and read what he actually said. I also wish for nothing more than the restoration of Manila to its pre-war eminence. So much poor development happens because we forget and because so many have not ever seen what it was like before. Thank you for keeping the memories alive for us. Hopefully our generation will look back for inspiration for the future development of our city. I look forward to more of your posts! Re the photo(courtesy of Lea) showing Hal Bowie (inside a KZRH announcer’s booth)…the guy on the left with a moustache was my Dad, John Arville. I remember during the Japanese Occupation watching propaganda movies at the Heacock Building in Escolta … on the ground floor. This was probably 1942. I also recall that in the early 50’s, the Americans used this building as USIS Library and I used to go to that place looking at all the magazines in that place. Is this the site of abandoned building of Syvel’s Department Store now? Escolta corner David Street (Burke Street now). Iam an architecture student and I will be making a project about filipino architects and their WORKS. This Heacock’s department store is design by Thomas Arguelles, the architect I choose to document. My problem is, I can’t find any source of Floor plans of it which is very important. This would be the biggest part of my project. If you don’t mind, Can you send me a help? Can you describe the out look of it inside or outside? It will be a big help for me! Thank you. So the most recent Heacock’s before the War were neighbors with the Regina Building, was that it?